Duane was born in Kansas City to Helen Barnes and James Barnes. He was the youngest of three boys. His brothers are Randy Barnes and Dennis Barnes. He married after graduating high school to Janet Ash, together they had two daughters Leanne and Jamie Barnes. Duane also served the country in the United states Navy before settling down in Camdenton to raise his family. Duane worked as an electrician both as a civilian and a service man. He was an avid video gamer and enjoyed fishing and the newest gadgets. He loved spending time with his grandchildren. 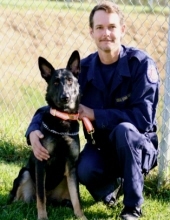 Duane loved his dog, Hope, and together they worked on the search and rescue team where they had several endeavors. Duane is preceded in death by his grandmother Velma, and his Grandfather Nate. He also is proceed by his older brother Dennis. He is proceeded by his Step Father Jimmie Rodgers. Duane is survived by his Mother and Father and his brother Randy. He is also survived by his daughters Leanne Barnes and Jamie Moore and husband Josh. Grandchildren Alexander, Gabriele, and Lindsey. To send flowers or a remembrance gift to the family of Duane Barnes, please visit our Tribute Store. "Email Address" would like to share the life celebration of Duane Barnes. Click on the "link" to go to share a favorite memory or leave a condolence message for the family.